The “Speed Lump.” Not a Typo. It’s Inexpensive Traffic Calming. Last week while vacationing in the Bay Area, I took a bike ride around the East Bay waterfront and discovered the land of Alameda, CA, where apparently I thought someone had humorously vandalized this sign when I rode up to it. But as I soon found out speed lumps are fact, not fiction. 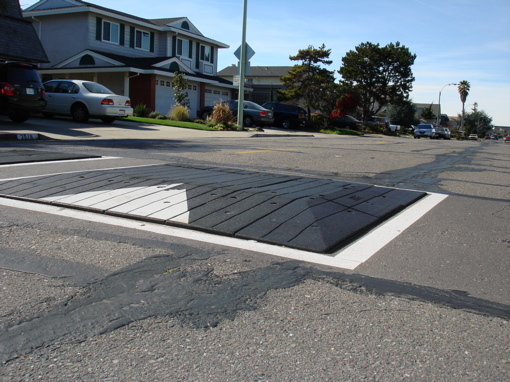 A cousin to the traditional speed hump, speed lumps are used in locations where communities would like to have the effects of a speed hump without slowing the speed of emergency vehicles. 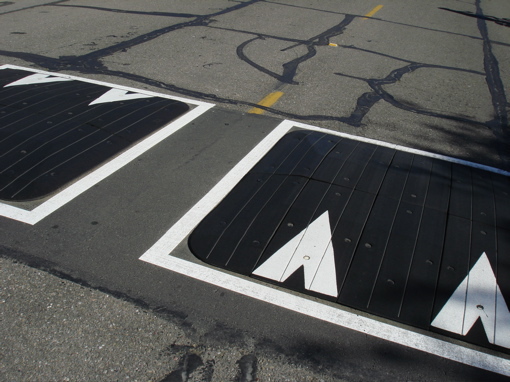 The lumps are commonly made out of prefabricated rubber shapes and bolted into place – leaving gaps for the tires of wide vehicles by evenly spacing them three or four across a street. Though I couldn’t find much on the Internet about speed lumps, I learned from Noah Budnick at Transportation Alternatives that in the United Kingdom, these are called "speed cushions" (or "speed pillows!") Not only does the speed lump not impede the progress of EMS vehicles, buses, and fire trucks, but it also allows cyclists to sail smoothly thru the gaps in the pre-fab structures. In many areas of New York City where there is community opposition to speed humps, lumps — or "pillows" — could be a great solution. As I watched the vehicles slowing on this residential street, I thought how nice it’d be to have stacks of these cheap, easily-installed traffic-calmers on hand at the Department of Transportation. 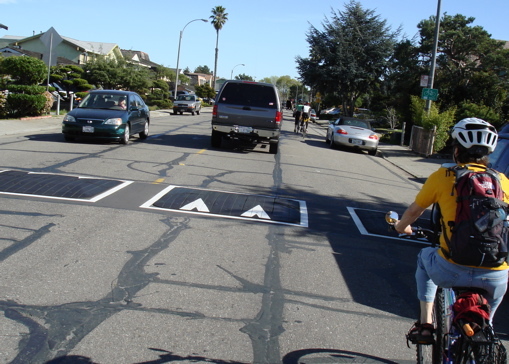 Perhaps traffic-calming doesn’t have to be so expensive and technically difficult to build. Note: These photos were taken along Bayview Drive in Alameda, CA. Perhaps they could be removed seasonally, so they don’t get in the way of snowplows. These look great – my only concern is that speedy hummers and other SUVs would be able to drive through the lumps, just as an emergency vehicle would. But the easy installation / removal and bike friendliness likely outweigh that. From my observations there: SUVs were hitting them, Hummers, while I did not see one – possibly, could avoid, but my guess is that it would be a tight fit and they probably would have to slow anyway. Another important thing about the placement of these: Alameda has a bike route that circles the island. Bayview Drive is part of that network. What’s hinted at, but not directly addressed, is the usefulness of these types of devices for trials. Not to re-toot my own horn, but Aaron had a similar thought here. Make speed lumps out of recycled material sounds great but doesn’t work. They warp and wear out. Also, the paint on the speed lumps fades and they become hard to see at night. They can’t be r-used if pulled up for snow plows each winter. Only one company has mini-hump that solves all those problems. 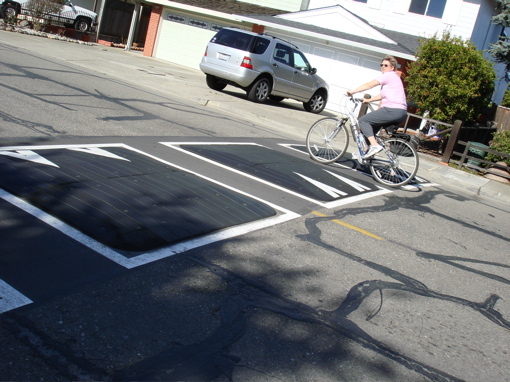 Clarence – Humps were developed to address concerns related to emergency response times. They are designed such that a large truck can traverse the hump with little vertical displacement. Unfortunately, this also means that large SUVs derive the same benefit so humps are sliughtly less effective than humps. That bit of information is hopefully payment for gaining access to the video you prepared on physically separated bike lanes. I am a member of the Institute of Transportation Engineers (ITE) Pedestrian and Bicycle Council and we are interested in starting a research project on appropriate applications of these facilities. You likely know that they are expressly discouraged in most roadway design manuals. Please contact me and we can talk more.